Summertime. Forget the fruit that comes from elsewhere, shipped around the world and earning more frequent flyer miles than do I. Look for local, look for seasonal, and enjoy the delicious fruits of summer. Red raspberries. Especially luscious, fragile, and easily bruised. And wonderful blueberries. 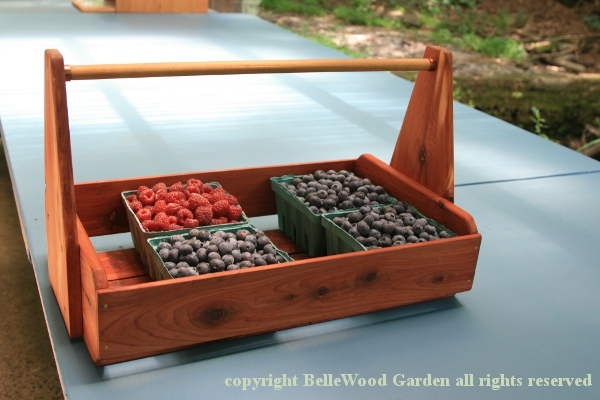 As an aside - are you aware that cultivation of blueberrie originated here in New Jersey? Fact. Miss Elizabeth White's family, of White's Bog, down in the Pine Barrens, cultivated cranberries. They're still grown today, harvested in October. She wanted another crop to bring in income at a different time of year. One hundred years ago it was accomplished. Rather than forage for them, the blueberries of summer became something we could buy. How rare it is to know who actually introduced a new food into cultivation. But after summer comes the fall, and then winter. With the turn of the seasons come appleas and pears. What if you want to enjoy the taste, the memoy, of summer? Capture it in a jar. Make sweet preserves. 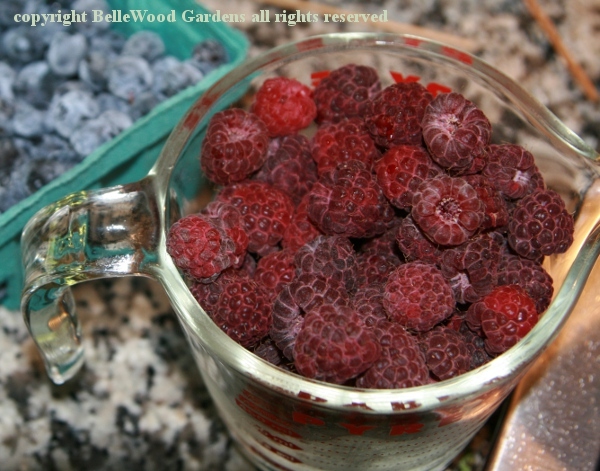 First step, after buying the berries, buy some 1-cup / 8-ounce canning jars. Get some 4-ounce jars too. Wash with soap and water, rinse very well, then sterilize in a pot of water brought to a boil. Prepare a jar or two more than you think you'll need. Better to have an extra than run short when it is time to fill them. Rinse the blueberries, put them in a large pot with some orange juice, zest from the oranges, some lemon juice, and begin heating. When things reach a simmer, add the raspberries. I'm out of my home-made pectin at the momment so I'm using commercial low-sugar pectin. Add the sugar and boil for one minute. 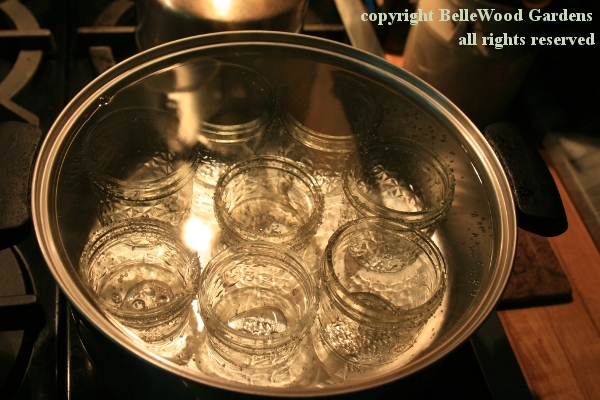 Carefully remove the sterilized jars from their water bath, and fill. Cap, and process in boiling water for 15 minute. 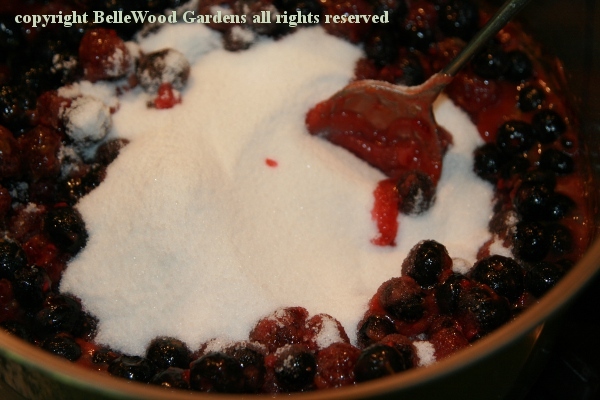 Next January, enjoy a July memory as you savor blueberry raspberry jam on your breakfast toast, as snow descends past the windows and fire crackles in the wood burning stove. Sterilize jars. Set flat lids and rings in small pot of hot water keeping at a simmer. 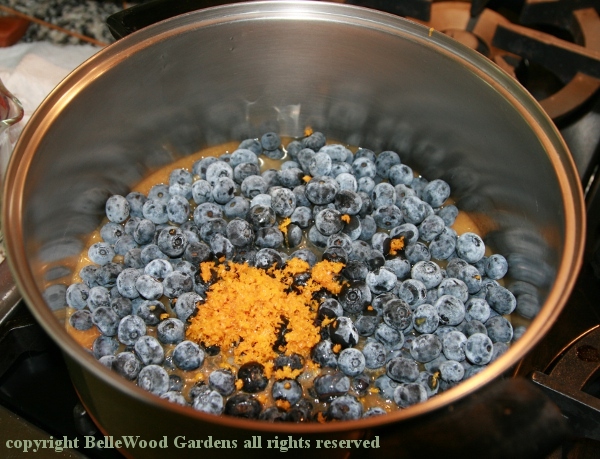 Rinse blueberries, put in large pot together with zested orange rind, orange juice, lemon juice. Start heating over moderate heat. 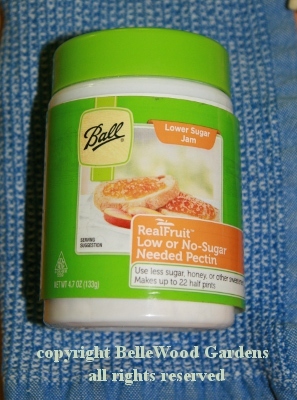 Add Ball low-sugar pectin. Stir well. Bring to boil. Add sugar, boil one minute. Use jar lifter to remove sterilized jars from hot water. 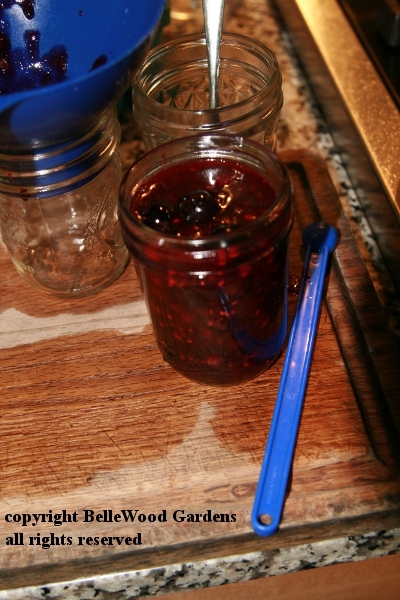 Laddle jam into jars, one at a time, leaving a 1/4 in space below rim. Wipe rim with paper towel dipped in hot water to ensure good seal. Use lid lifter (small magnet on a plastic rod) to remove flat lid from hot water. Finish capping jar with ring, fastening finger tight. Return to hot water bath, then finish filling and sealing remaining jars. Bring water back to boil, and process jars in water to cover for 15 minutes. Remove from water and stand on wooden surface. Tighten rings. Do not shift jars until cool. As jars seal there is a pinging noise as the flat lid compresses slightly. Note: If foam develops while making the jam there are two options. Either skim the foam off with a spoon. Or add a teaspoon or two of butter.